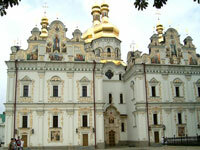 Kiev-Pechersk Lavra (the Caves Monastery) is a fascinating living piece of history dating back to 1051. The Venerable Anthony, a devout monk, settled in a cave on the western bank of the Dnieper River. He was soon joined by his followers and their numbers swiftly began to outgrow the caves. Prince Izyaslav and other Kievan aristocracy were frequent visitors to the Venerable Anthony and donated money to build a church and aboveground monastery. Since that period, the monastery has continued to grow and is still active today, serving as an important centre of Orthodox Christianity and reflecting a fascinating way of life.